The City of London Common Hall meeting (“The Hustings”) was held on 25 June in the historic Guildhall. 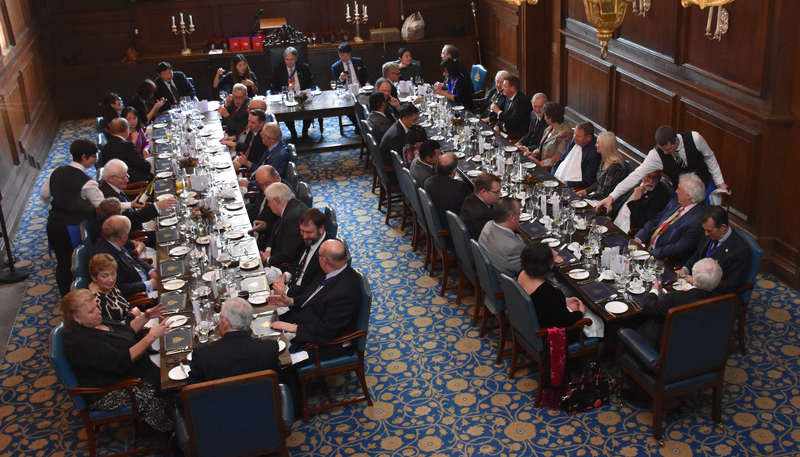 Some 1200 liverymen of the several Livery Companies attended to elect the Sheriffs for 2018-2019 as well as the Bridge Masters, Ale Conners and Auditors. Alderman and Solicitor VINCENT JOHN KEARNEY was elected as the Aldermanic Sheriff. There being three candidates, there was a contest for the post of Non-Aldermanic Sheriff. This had not happened for several years and the Livery Committee, together with the City had devised a way to measure the support for each candidate such that, subject to the various candidates’ agreement, there would be no need to hold a further formal election. Citizen and Tallow Chandler RICHARD FLECK received 30% of the votes cast. Citizen and Framework Knitter MARGARET ELIZABETH GREEN received 60% of the votes cast and was proposed to be the Non-Aldermanic Sheriff. Citizen and Glass Seller GWEN RHYS received 10% of the votes cast. Following the election Vincent Kearney and Elizabeth Green confirmed that they were each willing to serve as Sheriff and proclaimed their allegiance to The Lord Mayor. Peter Gordon BENNET and Martin Frank HOWARD were elected unanimously as the Bridge Masters. Jonathon Martin AVERENS, Dean Edward FISHER, Dr Christine Holliday Rigden and Frederick Joseph TROWMAN were unanimously elected as Ale Conners. Nicholas BENNETT, Janet DAWSON, Paul DOSSETT, Amanda Susannah FRANCIS, Leigh LLOYD-THOMAS and Paul Richard WATTS were elected unanimously as Auditors for various terms. A summary of the report of the Livery Committee was then given by the Assistant Town Clerk. The Common Cryer then put the report to the meeting and it was unanimously endorsed by all present. He then dissolved Common Hall with the words “God Save The Queen”, which was echoed by all present, and the Lord Mayor, Aldermen, Sheriffs and Officers left the hustings in reverse order to the entry procession, followed by the Livery Committee and then the Masters, Prime Wardens and Upper Bailiffs of the several Livery Companies present. Thus the ancient and time honoured ceremony associated with the Election of Sheriffs and Other Officers for 2018 – 2019 was completed.